I have been lurking around this forum for a while and I think its time for me to share what Im up to. I am currently building a Cloud Control Station for my quadcopter which the goal is to be able to manage one or many drones constantly connected to the Internet and ready for take off with the possibility to stream video using gstreamer connected to a video server for multiple viewers. First version of the PoC that is shown on the video is a web server based on Python using DroneKit and the version right now Im working on now has been re-written to use pure Node.js and Mavlink messages to communicate with the ArduCopter on TCP port 5760. The hardware Im using right now has not been optimized for flight time but for functionality. In terms of connectivity, I will be using SSH tunnels between the Drones and CCS. Prototype in action, first test video. Hey Johan! That’s pretty cool. How is the experience with WebRTC? Its working pretty well. I did for a longer time do Peer-to-Peer WebRTC sessions before I switched to a video server due to the fact that you can have one stream source that multiple users can view and is a lot more stable than a P2P session. For a longer period Firefox was the goto browser for a smooth video, but since Chrome did some changes in the video decoding a few month ago its working as well in Chrome. I’m interested what are the latency values for both variants (p2p and server)? I dont have any specific numbers, it all comes down to network connection and encoding and decoding. Right now Im using Pusher as a signaling service, would work with Socket.IO or similar too. 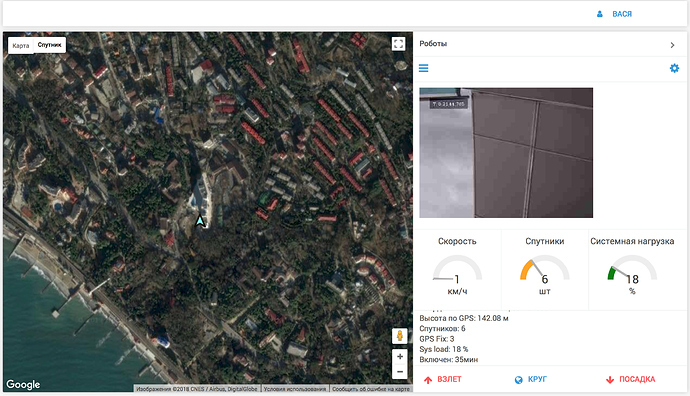 Are you using DroneKit to feed info such as the speed, altitude, etc? Because you mention both that you are using DroneKit and SSH? 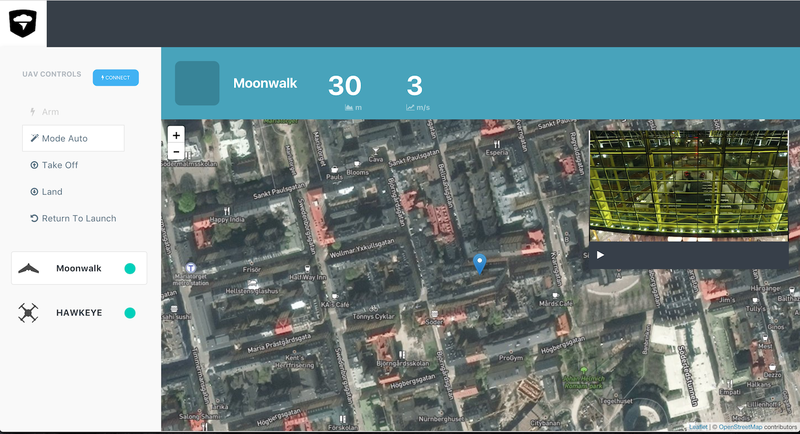 Are you using sending the telemetry data using DroneKit over SSH? 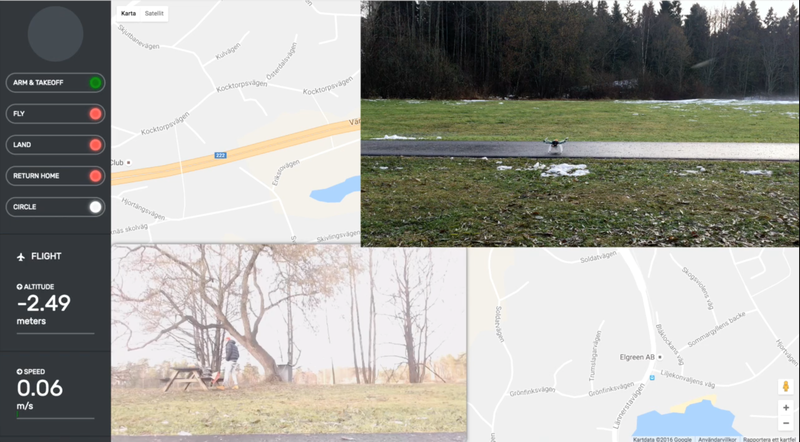 In the PoC I made with the video attached to the initial post is using DroneKit and also running the webserver to connect to it directly on the Raspberry Pi and connected from the computer via WiFi, not an optimal solution but I just wanted to put together some existing components. In the version Im buildning now I will be tunneling Mavlink messages from the APM (ArduCopter - Ardupilot) via SSH between the user and UAV. All those Mavlink messages will contain all information that is usually displayed in a GSC. 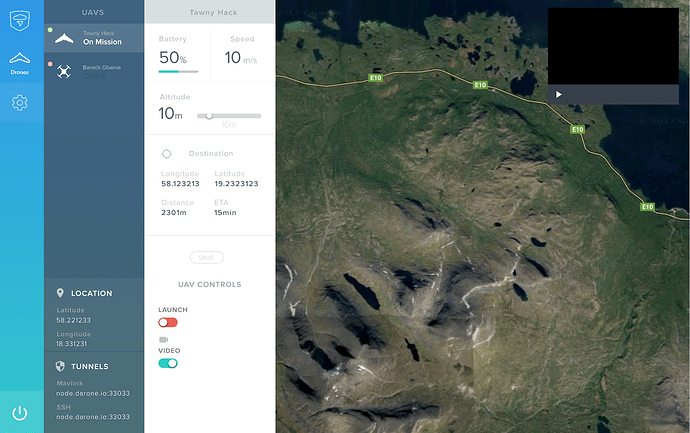 The Goal is to make it as simple as possible to remote control UAV´s, so all data that the mavlink provides will probably not be available at a glance. Wow love that your keeping it real and staying active. I also really love the super slick interface, I’m surprised by how many web dev have clunky portals. I agree the SSH is a much more clever way than dronekit. 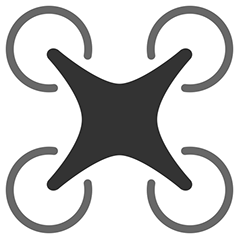 However, dronekit may still allow some additional features, maybe could be incorporated as a “module.” Im fairly new to web development and Im still getting the drift of swift, so pardon me for possibly basic questions. I was curious as to what you were using socket.io for, is this to send the mavlink data in real time between the client and web server? Also Im very curious what your using Ruby for it says webapps what do you have in mind for this? I would be willing to help in anyway possible, as I said unfortunately I’m relatively new to web dev beyond bootstrap and css which I’ve already dived in to my liking (I’m sure I could get better at handling CSS). However, if you need any beta testers or anything I would be happy to! Thank you for the kind words @Deathstroke5467! The DroneKit-Python or mavproxy is not an option for me right now since Im not using Python at all in this setup. Yes, the Socket.IO is the communication layer between the drone and client, basically an interpreter from web to mavlink. The cloud solution will consist of three parts. Rails Web app that provides configuration settings such all available tunnel servers, dynamically assign unique ports to the tunnels. 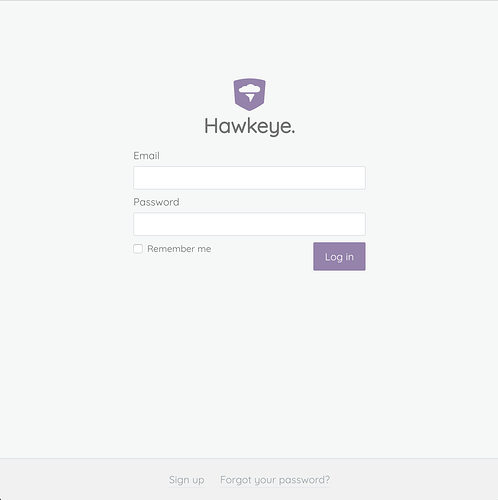 This will also be where the user interacts with the HawkEye services, user admin/mission controls etc. Node.JS - The node will be a middleware gluing the previous two functions. They will scalable and work as tunnel servers and also be responsible for the real-time communication between the user and the UAV. I made some really good progress tonight so now Im able to register new UAV´s in the from the command line on the RPi´s and establish tunnels that is accessable externally for testing using other Ground Control software. Way to go Johan! i Will kopp following your progress with great interest. You might think I have been lazy this weekend, no not really! Great progress on the platform. This weekend I have been focusing on putting all pieces together to establish required connectivity in terms of setting up SSH tunnels to the node servers and authenticate the raspberry pi automagically. The connectivity is basically done, it will set up two tunnels for each UAV. One for MAVlink connectivity and another one for a daemon I made called Dcontrol. 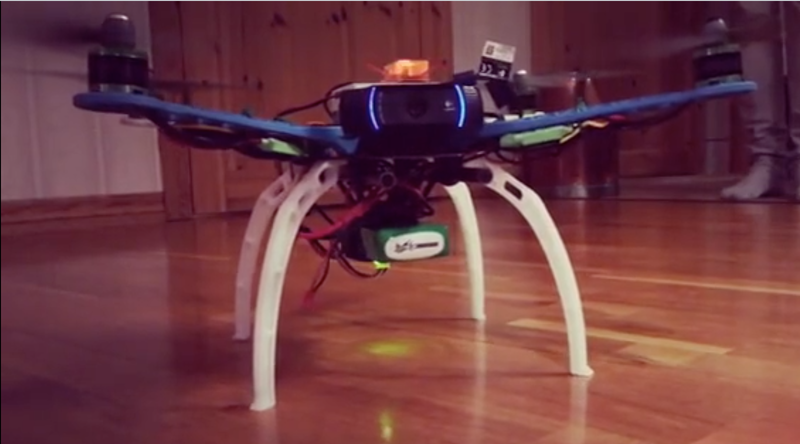 The platform will dynamically assign a tunnel server and two unique ports when starting the UAV client on the RPi. The purpose of the Dcontrol is to execute commands locally on the UAV, such as start video, stop video, reboot. This commands will be initiated by the user in the webUI and transmitted to the RPi through the dcontrol ssh tunnel. Right now Im testing out different resolutions on the video stream currently 360p, 720p and 1080p. The latency of the 360p is below 1 second which is good, but it gets higher with the resolutions. After some silence since due to the hard on this last weeks. Here are some updates from the project. Currently implementing Front-End/UI in React on the Ruby on Rails backend. Next steps is to actually connect it to the communication server who receives the MAVlink communication between user and UAV. The process of getting your UAV added to the platform is very easy. One tunnel for D Command (a custom binary daemon) which you can send commands such as start/stop video etc. For the MAVlink tunnel you can also connect with other GCS if you like as long as you have internet access. Hello, some update from the project. Working with the UI/UX, its really hard to nail since its so much information and controls that are needed. Here are the latest update of the design, hope you like it. My plan is to have a closed beta in end of May, let me know if you are interested to try it out. Requirements for testing the platform is basically a RPi with internet connection (Wifi,4G) and compatible APM that runs ArduPilot. How is your project? ) Is it possible to test it? I had worked with Johan on the shell scripts, you can find the bitbucket here. Though it hasn’t been updated in about 6 months now. I also checked the website darone.io and it looks like the backend is no longer there as I cannot log in. Only the landing page seems to be working and 2 drones are registered, so it seems it is either dead in the water or has been put on the back burner for now. I remember Johan had been working on this for some sort of search and rescue organization so perhaps either it was not received as well as expected or was put on hold as he got busy with other things. I’ve tried contacting him once I can try again as I was interested myself. I’ll tag him her just in case he still checks @johan. I am planning on making my own implementation of this project but it is low on my current list of projects and I have many other web dev things to work on before I get there. Marcello, thank you for info! 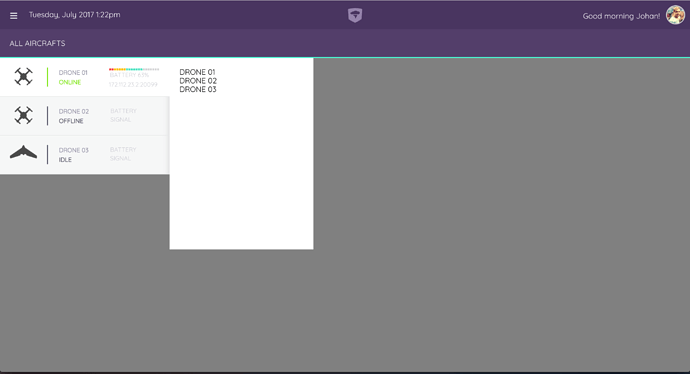 Anyway, I’m making my own solution to communicate with Ardupilot from web-server. Now it’s possible to send MAVlink to server, get data from messages and translate it to web-client. Also it’s possible to transmit video. MAVlink and video use socket.io to communicate with server and web-client. Robotics development. Roboflot has 12 repositories available. Follow their code on GitHub. One for board and one for server. @11113 Awesome, thats actually how I was going to build mine, by forwarding mavlink to server. Darone actually used SSH access, which both has it’s advantages and disadvantages. I thought it to be too complicated. I may make my own implementation down the road but I will definitely follow your project! Maybe I can help you out with the project if you need anything? I’ve been working a lot on React a lot so we might be able to throw together a nice frontend.